In Thomas Wolfe’s novel, “You Can’t Go Home Again,” the protagonist, George Weber, is a fledgling writer who has published a novel about his hometown in the US. The book turns out to be a huge success. When Weber returns to his hometown, however, he is greeted by hatred and fury from townspeople who think Weber has betrayed his hometown by delineating it wrongfully and critically. Amid death threats and menacing gazes, Weber is forced to leave his hometown. Now, he will never be able to go back home again. Outcast, Weber goes to New York and witnesses the rise of capitalism that creates social commotion. Then Weber travels to Berlin where he finds the rise of Nazism that creates national frenzy and international crisis. He is disillusioned by both capitalism and fascism, and both the America and Germany of the early 20th century. In Korea, too, there are people like Weber who have involuntarily gone into self-appointed exile, either disillusioned by their home country or threatened by it. During the military dictatorships of Park Chung-hee and Chun Doo-hwan, for example, quite a few Koreans immigrated to the US, disenchanted by the sociopolitical situation of Korea at the time, seeking a better chance in the country known as a dreamland for immigrants. Today, Korea has become a democratic, economically well-off country envied from abroad. Strangely, however, there are those who still want to or are forced to leave the country and become expatriates. Ever-menacing micro dust is among the reasons. Political disillusionment is another. Some time ago, I met a friend who was a colleague at Seoul National University. We had many things in common. When we were young, we fought together against the military dictatorship by participating in various anti-government protests. When the Dong-A Ilbo suffered financial crisis in the late 1970s as the dictatorial regime of Park Chung-hee prohibited advertisers from carrying ads in the major newspaper, he and I tried to support the anti-government newspaper by participating in a nationwide donation campaign. Although it was merely a symbolic gesture of a small amount of money, we each received a flag of gratitude from the newspaper that we still proudly keep in our offices. During the dictatorial regime of Chun Doo-whan in the late 1980s, he and I also participated in founding the stoutly anti-military government newspaper the Hankyoreh Shinmun and became founding stockholders. We did it at the risk of our jobs at Seoul National University because by doing it our names would be on the blacklist of Korea’s Central Intelligence Agency at that time. Perhaps my friend was oversensitive. Nevertheless, if he was reluctant to return to his homeland, something was not quite right. He was uneasy about the current social milieu and atmosphere of Korea. But your home should be a place where you can find comfort, not fear or hostility, and your home country must protect and embrace you, not intimidate you. If you cannot go home, it surely is tragic both for you and your country. Considering his past career, my friend was undoubtedly a true liberal. Obviously, however, he was disillusioned by the radical progressives who were running the country, not to mention the ever-disappointing conservatives. Wolfe’s protagonist Weber, too, was disillusioned by capitalism and fascism alike. But Marxism could not be an alternative for him, either. Weber was abhorred and threatened by his own hometown because he did not depict his hometown favorably in his novel. In that sense, my friend resembled Weber. It would be sad and embarrassing if people like Weber and my friend could not go home again. We should let them go back home. 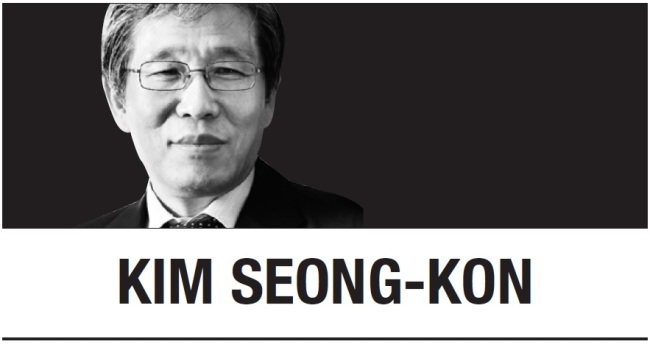 Kim Seong-kon is a professor emeritus of English at Seoul National University and a visiting professor at Kyung Hee Cyber University. -- Ed.